I woke up on August 9, 2014 to the sound of my mum talking on the phone. It sounded serious, grave even. Someone had passed away it seemed and from my mum's reaction, I knew it was someone close. Few minutes later, my mum hung up the phone and said,"Dr. Tom passed away early this morning". I couldn't believe my ears or rather, didn't want to believe it. You see Dr. Festus Tom Fernandez had been our family physician since 1982. 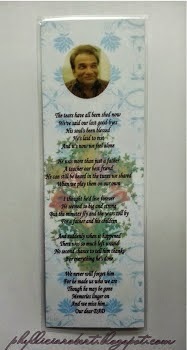 Our families were very close, with his eldest daughter and my elder sisters literally growing up together. I just can't remember not knowing them as they had been in my life since day 1. Perhaps due to the fact that I had known him all my life, he was one of those elements that I had felt would always be around in my hometown. Unconsciously, I've thought that there would always be Dr. Tom in his clinic at the corner, near the post office. That's why the news of his passing came as a shock to me. It was as if a brick was taken out of a solid wall, leaving a glaringly obvious and irreplaceable space. 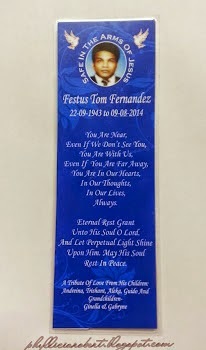 His requiem mass was held on August 12, 2014, 10.00am at the St. Fancis Xavier Keningau Cathedral. Looking around at the sizeable turnout of people at the service, I felt touched. In this age when it is easier to just offer e-condolences, people of all ages, race and religion had chosen to come and pay their last respects to Dr. Tom in person. If there was to be a light in this dark cloud of tragic loss, it would be that he had managed to unify the community in grief so strong that an electronic message was just not enough. There was a moment when a recording of Dr. Tom singing along to Elvis's 'I Can't Help Falling In Love With You' was played. It was recorded by his youngest daughter without his knowledge while they were travelling together. There wasn't a dry eye in the Cathedral including mine. The lyrics that touched me the most was "Take my hand, take my whole life too. For I can't help falling in love with you". In that instance, it was as if he was singing those lyrics to God somehow. Click to hear the full song. My dad told me that Elvis was one of Dr. Tom's favorite singer. 1. Whenever I was sick and went to see him, he would always ask,"What happen maa?" and listen attentively to what you're saying. 2. He had a talent in interior design. He can make a small space so functional and beautiful. It was one of those things that I found very interesting about him. 3. He had a calm demeanor and voice. I was never afraid of being treated by him, even as a child. 4. My ears were pierced at his clinic and I was given a lollipop because I didn't shed a tear. Hehe..
5. He was a very gracious host, opening his home to close friends to visit and have a chat. 6. He and his family threw fabulous Christmas and birthday parties every year which I loved going to. Delicious food and great company, what's not to look forward to? 7. He was a caring doctor, even sending patients to the hospital with his own car if circumstances were dire. 8. From my observation, he was a good father to his children. He nurtured their talents and supported their interests as well. Dr. Tom, your passing is a loss to our community. The only small comfort we get from it is knowing that you are with the love of your life right now, in a better place and free from suffering. Thank you for all your care and help as well as for inspiring us in many ways. Rest in peace dear Dr. Tom. Know that you have saved the lives of many and touched the hearts of plenty. You will be missed dearly. Phyllicia S. Robert and family.